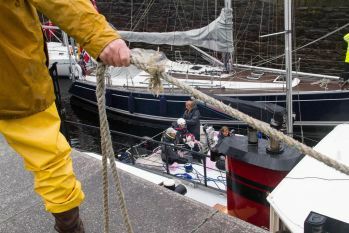 Yesterday offered another milestone in Natasha Lambert’s Sea and Summit Scotland challenge – the conquering of Neptune’s Staircase, a flight of eight locks. These lie between the Caledonian Canal and Loch Linnie, and their descent allowed the young sailor to continue her passage towards the Clyde. As Natasha’s Miss Isle Too yacht entered the first lock it was dwarfed by some large sailing cruisers and a 1945 Dutch barge. Her support RIB and team entered the lock behind her. Then the first of the nine enormous gates was closed behind them. Whilst there was no sailing involved Natasha and her crew still had to keep a close watch. The water flooding out of the lock creates eddies in the loch which can clash the boats together. It has to be said there were a few anxious moments as the barge moored next to Miss Isle Too moved significantly as it descended. At the last lock the crew were treated to the sight of a huge steam train crossing the lock. Its tracks and the road bridge had to be swung before Miss Isle Too and other boats could get underway. 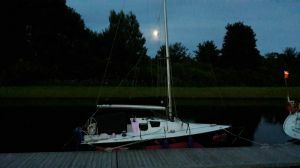 Natasha then moored up for the night in preparation for today’s exit into Loch Linnie. 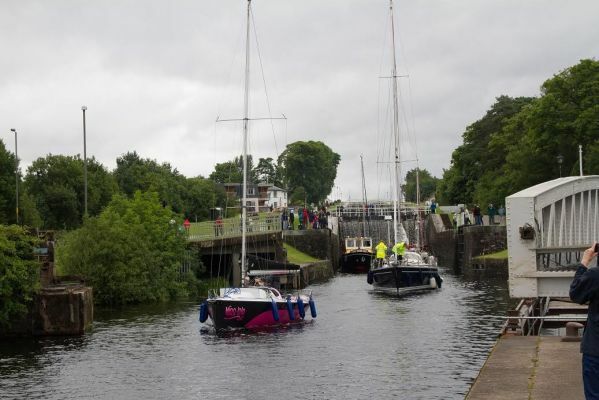 Next stop Oban on the way to another scenic canal – the Crinan. 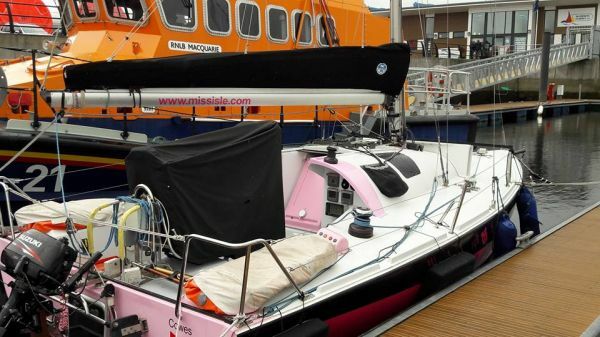 Natasha, and her team, are undertaking Sea and Summit Scotland to raise funds and the profile of her charity, the Miss Isle School of Sip Puff Sailing. Natasha is keen to ensure that others with similar physical conditions are inspired to face new challenges and, if they would like to, get on the water and start sailing. Please support Natasha’s efforts by donating online – click here. 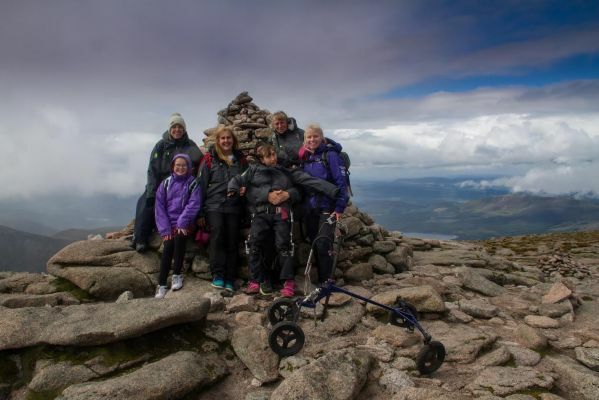 Natasha Lambert has completed one element of her latest challenge, Sea and Summit Scotland. She reached the top of the Cairngorm Mountain, in the Scottish Highlands, just after three o’clock on Monday Twenty Fifth of July 2016. It took her just over five and half hours to reach the summit which is some 1245 metres above sea level, the sixth highest mountain in the UK. Natasha has athetoid cerebral palsy and uses a wheel chair. However, for this part of her challenge, she used a special device called a Hart Walker. This pulls Natasha upright and enables her to propel herself forward. Natasha also wears a lycra corset to assist in keeping her straight as she walks. This can be extremely hot when the weather changes quickly. Natasha was supported by her Dad, Gary, Mum Amanda, little sister Rachel (9) and a team of helpers including local Mountain Safety Advisor, Heather Morning. The whole team was needed to assist in guiding Natasha over the rough, steep terrain which, on numerous occasions, required the entire walking device to be lifted bodily over boulders. Weather varied from bright sunshine to hail and winds of over 25 miles an hour at the summit. Surprisingly one of Natasha’s most arduous parts of the day was the descent. Her position in the walker makes walking down feel extremely precarious. The team then have to play their part by preventing her from descending dangerously fast. 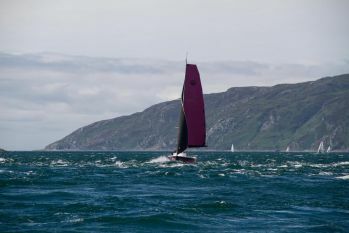 Natasha now returns to her yacht to continue the second part of her challenge, sailing to Glasgow. The young adventurer sails using only her breath to control her specially designed yacht, Miss Isle Too.